TLDR: 3.5 out of 5 for a great concept well written but with more style than story. On the surface, Grendel is a re-telling of part of the Anglo-Saxon Beowulf poem from the point of view of the monster, Grendel. Beneath the surface is a clever satire, an examination of the works of Sartre, and an examination of the human condition. The audio version us superbly narrated by George Guidall, who uses a pompous, growly voice for the beast. Do you remember the character of J. Peterman from Seinfeld (played by John O'Hurley)? Imagine an older, more surly version of him recounting a tale of his past glory antagonizing the vikings and waxing philosophical. I really enjoyed this through it's first half. The writing is poetic, and Grendel himself is a lovable curmudgeon who cannot help but be fascinated by the humans he encounters. He spies of them, watching them and learning from them. And occasionally he breaks into their halls and eats them, delighting in the mayhem. He finds them both endlessly fascinating and delicious. As a story, however, it begins to lose direction in the second half, then comes to an abrupt end. There's a lot to like here, but this is one of those novels requires a broader education in philosophy than I have to fully appreciate, I suspect. 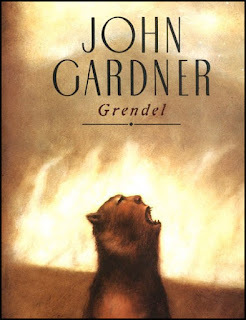 I did really enjoy the character of Grendel and his voice (as performed by Guidall). Many of the story-telling elements were really well done, too. Take a listen to the video attached - skip forward to 39:00, if you like, to hear Grendel describe his first meeting with the humans. "In some ways, they were like us, except ridiculous and at the same time mysteriously irritating, like rats. They movements were stiff and regular, as if figured by logic." Later, Grendel spies of Hrothgar's hall and listens to the shaper (poet) speak to the vikings. Of him, he says "His manner of speaking was infecting me, making me pompous!" Grendel is scandalized that all the humans put up with this man and his "lies". Definitely one of the more interesting books I've read in the last few years. 3.5 out of 5 for me.